U.S. 1 Section RC1 is the first of three construction contracts to rebuild and widen U.S. 1; replace aging bridges; and install safety enhancements along a 4-mi. section of the expressway. Construction began Oct. 29 on a four-year project to reconstruct and widen a 1.3-mi. section of U.S. 1 from Old Lincoln Highway to just south of the Neshaminy Interchange in Bensalem Township, Bucks County. "This project is a key component of a multi-phase effort to improve travel and safety along a heavily traveled portion of U.S. 1 in Bucks County," Gov. Tom Wolf said. "It's major infrastructure investments like these that are helping our transportation network and local economies flourish." Additionally, this project includes the construction of a sound barrier and retaining wall; installation of 13 sign structures, traffic signals and Intelligent Transportation Systems (ITS) equipment along the corridor; relocation of sanitary sewer and water service lines; upgrades to drainage and stormwater systems; and construction of on-site and off-site mitigation sites. The project will begin with utility relocations, upgrades and minor improvements to facilitate traffic during the three main construction stages beginning in spring 2019. Initial activities this fall and winter include temporary reconstruction and widening of existing shoulders along U.S. 1 and Route 132 (Street Road); installation of a temporary traffic signal at the intersection of Route 132 (Street Road) and Township Road; the extension of Township Road to several local businesses on U.S. 1; and construction of new driveway configurations for the Red Roof Inn. Additionally, stormwater system improvements and stream mitigation activities will commence in various locations along the corridor. In early 2019, reconstruction of existing northbound U.S. 1 and the bridges will begin, as well as construction to replace and improve the Pennsylvania Turnpike and Route 132 (Street Road) interchange ramps adjacent to northbound U.S. 1. 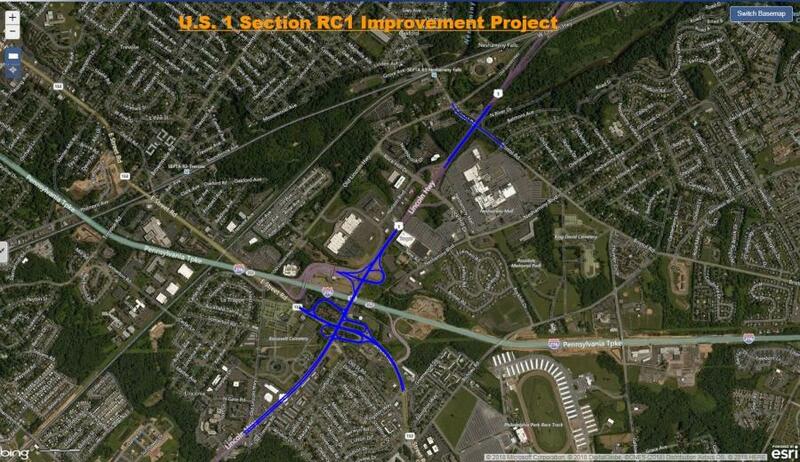 Concurrently, the contractor will begin rebuilding eastbound Route 132 (Street Road) and incorporate two new ramps adjacent to eastbound traffic for the realignment of the U.S. 1 Interchange at Route 132 (Street Road). Allan A. Myers Inc. of Worcester, Montgomery County is the general contractor on the $97,352,764 project which is financed with 80 percent federal and 20 percent state funds. All work on this project is expected to complete by the end of 2022. For more information, visit us1bucks.com.